A COMMUNITY of COLLECTIVE JOY! 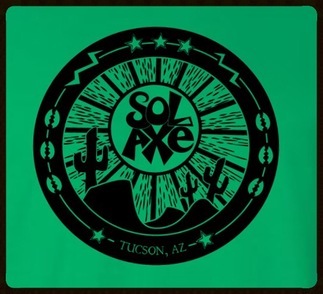 Sol Axé (pronounced, Sol – ah –SHAY) a project under Many Mouths One Stomach, is a nonprofit drum and dance community in Tucson, Arizona. Inspired by the music of Brazil, Sol Axe features the music of many traditions from Brazil, the African Diaspora, and the World. Our intention is to inspire creativity, inclusiveness, community solidarity, and collective JOY, through lessons and classes, outreach programs, workshops, and high energy performances. We collaborate with individuals and groups in Tucson, the nation, and around the globe, bringing the opportunity for artistic expression to all. Throughout the year, our group has opportunities to perform in the Tucson area, as well as other parts of the state with our sister groups Sambatuque (Flagstaff) and Grupo Liberdade (Phoenix). We regularly participate in Tucson Meet Yourself, the All Souls Procession, and the﻿ Mt Lemmon 4th of July Parade﻿. We hold an annual fundraiser, Monsoon Mania, each July or August, to raise funds for California Brazil Camp. EVERY TUESDAY we hold bateria (literally, "battery", in Portuguese) rehearsal from 6:30-8:30 PM at Rhythm Industry Performance Factory, 1013 S. Tyndall Ave. These rehearsals are opportunities for us to learn musical repertoire and dance choreography for an upcoming performance. Each member is guided to choose an instrument to learn, and encouraged to perform (although not required). We provide the instruments, instruction, group t-shirt, and best of all...a community of collective joy! Our membership is fee based and covers the cost of renting our space, instruments, and professional development of our leadership when possible. Scholarships and student discounts are available, as well as options for trade if you have a skill we can use...just ask! The soul of our group is the music of Brazil and beyond...and the way we express it is through DANCE! In Brazil, there is no separation between the music and the dance...everyone does both! The "national dance", or most well known dance, of Brazil is SAMBA. Samba is not only the dance, it is also a rhythm. We learn to play samba...and we learn to dance it! Sol Axé members who choose to focus on dance will learn choreography that goes with the bateria repertoire. NO EXPERIENCE is necessary. The goal is to have fun and be challenged to be part of a future performance. You can join the group as a COMMUNITY DANCER and the Membership is the same and has the same benefits as the Bateria, as listed above!